These days, the mission of the Santa Barbara Unified School District seems to be out with the old, in with the new, no matter what. And that includes its recent rewriting of its Mission Statement that’s been around as long as anyone can remember. This comes on the heels of other questionable actions that include dismissing or reassigning longtime personnel; closing the beloved and innovative-since-1975 Open Alternative School; shutting down the once highly touted Parent Resource Center, and spending nearly $40 million dollars on a new Peabody Stadium with 500 fewer seats than the old one. The adage, “If it ain’t broke, don’t fix it,” comes to mind — with the exception of Peabody Stadium, which surely needed fixing, but not at quadruple the original estimate. As Mission Statements go, it’s a little wordy, and I always wanted to add a comma after the word excellence, but that’s a little grammar-picky, I’ll admit. However, it contains nice buzzwords, embraces lofty goals and puts forth expectations that students of today will become citizens of tomorrow. Importantly, it conveys the school district’s commitment to ensure that students will become responsible, ethical, and productive. What could be wrong with that? 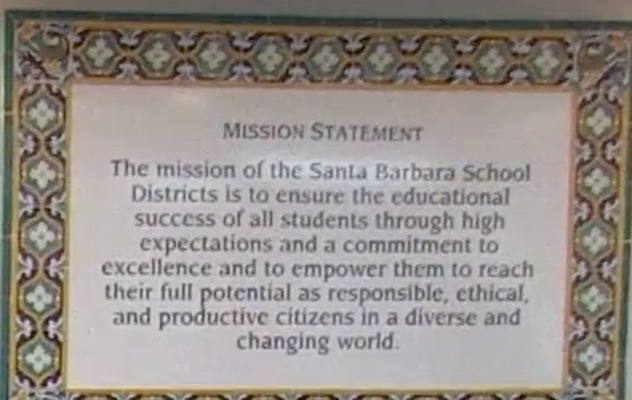 For years, that Mission Statement has been on display in the foyer of the district office and in the Board Room. It’s inscribed on a large tile mural with an intricately designed Santa Barbara-style border; the artistic rendering forms the backdrop for the school board meetings. That’s it. It’s an incomplete thought, without a subject, without capitalization, and lacking completely in inspiration. This is a Vision Statement without vision. The students of our vibrant, creative and activist community deserve better than these spare new slogans suggest. And so do the thoughtful taxpayers and generous philanthropists who fund the vital work of educators who are entrusted to lift up, educate, and inspire the next generation. The stringing together of words by committee reads like it’s what ended up on a whiteboard when everything else was erased. It’s the result of a series of bureaucratic team-building exercises around a conference table. It’s the product of groupthink without dissent, an attempt at collaboration without critical thinking or creativity — neither carefully crafted by a writer nor examined by an editor. These new statements fail to reflect the poetry of the art of teaching or to recognize the transformational work of educators who have the power to profoundly influence young lives in myriad ways so they can go forth and achieve their dreams. Surely this school district can do better now, as it always has: It’s where screenwriter/director Ron Shelton learned to write; where financier Charles Schwab compensated for his dyslexic difficulties; where dancer Martha Graham learned self-expression through movement; and where actor Anthony Edwards was so inspired by his teacher, he led the community effort to create a theatre named to honor her work. They are just a few of the notable graduates of this district who were inspired to create their own pathways into the great unknown. Let us strive — in our words and our actions — to stir the souls of our students and support those who serve as educational role models in our schools. Our mission is to instruct and inspire human beings to reach the heights of our individual and collective potential, by learning to work together in an increasingly interdependent world. This includes the development of good character, the expectation of good citizenship, the nurturing of imagination, the understanding of the value of both independent thinking and collaborative work; the creation of caring community. If a student turned in these statements as part of an assignment, the teacher would mark it up with a red pencil and give it an F grade — for failure to complete the assignment, or to reveal higher-level thinking on the matter. A thoughtful teacher would give the student another chance to make good, since everyone deserves a second chance. I suggest the educators involved in this first attempt go back to the drawing board — or just go back to the Mission Statement that served so well for so long. After all, that fancy tile mural in the Board Room would be a terrible thing to waste.